SFC Stright was born on February 18, 1980. He was a native of Libby, Montana, and volunteered for Army service in June 1998. Following Basic Training at Fort Jackson, South Carolina, and Advanced Individual Training at Fort Eustis, Virginia, Sergeant First Class Stright served with 57th Air Medical Ambulance Company at Fort Bragg, North Carolina, as both a helicopter mechanic and Crew Chief. In June of 2002, SFC Stright was then assigned to the 377th Air Ambulance Company at Camp Humphreys, Korea as the Company Standardization Instructor. In 2003, he successfully assessed with the 160th Special Operations Aviation Regiment (Airborne) as a helicopter mechanic. SFC Stright arrived to D Company, 1st Battalion, 160th SOAR (A), at Fort Campbell, Kentucky, in December 2003 where he served as a Crew Chief, Section Sergeant and Product Control NCO. 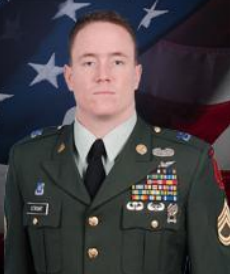 In September of 2009, SFC Stright was assigned as a Platoon Sergeant to C Company, 3rd Battalion, 160th SOAR (A), at Hunter Army Airfield, Georgia. SFC Stright is a combat veteran with 16 deployments, all in support of the Global War on Terrorism. His military training includes the Basic Non-Commissioned Officer Course, Warrior Leader Course, Special Operations Training Course, the Survival, Evasion, Resistance and Escape Course, the Aviation Accident Prevention Course, the Airload Planners Course, the Ground Safety Management Course, Combatives Level 1, Airborne School and Air Assault School. SFC Stright’s awards and decorations include six Air Medals, two Army Commendation Medals, the Army Achievement Medal, three Army Good Conduct Medals, the National Defense Service Medal, the Korean Defense Service Medal, the Armed Forces Expeditionary Medal, the Iraqi Campaign Medal-Campaign Star, Global War On Terrorism Service Medal, Armed Forces Service Medal, two NCO Professional Development Ribbons, Army Service Ribbon, Overseas Service Ribbon, the NATO Medal, the Combat Action Badge, the Senior Aircraft Crewman Badge, the Basic Aviation Badge, the Parachutist Badge, the Air Assault Badge and the Expert Marksmanship Qualification Badge (Carbine). He was posthumously awarded the Meritorious Service Medal and the Air Medal. Sergeant First Class Stright is survived by his mother, Kathy and his father, Robert.